Fine Gael councillor says drowned Syrian 3-year-old and family "were not fleeing for their lives"
Former mayor of Naas Darren Scully made the statement in a letter to the Sunday Times. Scully was forced to resign as mayor after being caught up in a racism row in 2011. FINE GAEL COUNCILLOR Darren Scully is no stranger to controversy. 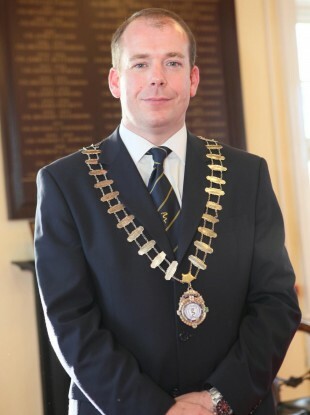 The former mayor of Naas, Co Kildare lost the party whip and was forced to resign as mayor after comments he made about black Africans (and his unwillingness to represent them) in 2011. He was subsequently accepted back into the fold and was the highest placed Fine Gael candidate (finishing in fourth place) at last year’s local elections, but this morning he stands at the centre of another row. Scully had a letter published in the Sunday Times on 13 September last, suggesting that the family of Aylan Kurdi, the three-year-old Syrian child who drowned along with his five-year-old brother off the coast of Turkey in August, were not fleeing for their lives. If I put my children in a small boat without life-jackets and tried to set sail to a nearby island I would be rightly called an idiot. McCarthy (Justine, Sunday Times journalist) tells the terrible story regarding the death of Aylan. However, she does not mention that the children’s father had been living and working in Turkey for three years. He was not fleeing war, as his family had been living with him in a safe country. He had tried to get across to Greece before. To me it seems obvious that when you are living and working in a safe country, you are not fleeing for your life. The letter is signed but doesn’t acknowledge his status as a Fine Gael councillor. TheJournal.ie was unable to reach councillor Scully for comment this morning, although it has been confirmed that the writer of the letter was indeed him. A Fine Gael spokesperson said that it “would not be appropriate for Fine Gael to speculate” on the specific circumstances that led to Aylan’s death. As the Taoiseach has previously said, Aylan’s image shocked the world. Can we swap Darren Scully for 10,000 Syrians? Last night Fine Gael Minister for Justice Frances Fitzgerald said that “Ireland will work closely and collaboratively with our EU partners” in response to the migrant crisis. “Ireland has always lived up to its international humanitarian obligations and we are fully committed to playing our part in addressing the migration crisis facing Europe,” she said. Email “Fine Gael councillor says drowned Syrian 3-year-old and family "were not fleeing for their lives"”. Feedback on “Fine Gael councillor says drowned Syrian 3-year-old and family "were not fleeing for their lives"”.